Can Mapping Save Lakes from Perils of Soil Erosion? 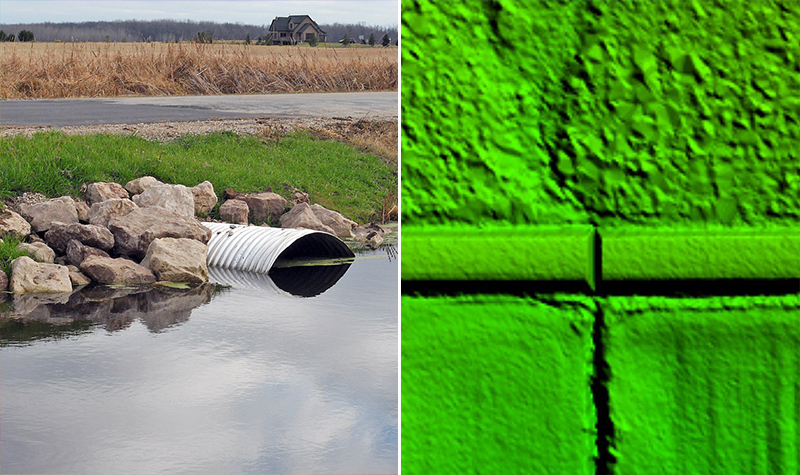 Culvert mapping and culvert asset management have been hot topics at the local, state, and even federal level lately. Runoff from rainfall events can carry nutrients away and transport soil to rivers and lakes. Site-specific and watershed-based factors can impact erosion, leading to sediment loading and other water and aquatic habitat issues. But how does a county know where its most at-risk sites are, and could a culvert inventory and high-resolution elevation data offer any insights? It certainly can, judging by the outcome of a recent project that successfully modeled soil erosion susceptibility in a northern Wisconsin county’s watersheds. Our team’s approach used existing lidar and high-resolution aerial imagery to collect over 4,000 culvert locations across Vilas County, measure the lowest points around the culverts at either end, and create a hydro-enforced digital elevation model, or DEM. Because the County had already undertaken high-resolution, leaf-off orthoimagery projects and high-accuracy lidar projects, the team was able to complete the hydro enforcement project without going into the field or doing a new flight. Everything was done efficiently from the office. 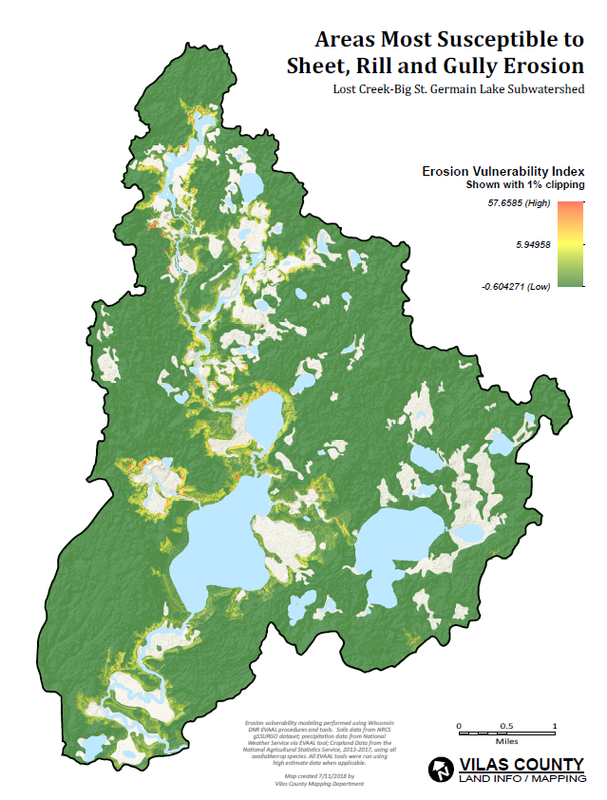 This data, created through a two- to three-month process, was then run through the Wisconsin Department of Natural Resources’ EVAAL (Erosion Vulnerability Assessment for Agricultural Lands) model. This ultimately produced highly accurate maps illustrating areas most prone to erosion and runoff in sub-watersheds that impact water quality in natural lakes. The maps show sensitive areas in the landscape, which helps with land use planning and water conservation efforts. Adam Grassl, GIS analyst with Vilas County, and I will present the workflow and resulting maps from these efforts, as well as discuss best practices and process improvement at the Wisconsin Land Information Association Annual Conference later this month in Appleton. Since every county in Wisconsin now has countywide lidar data, projects like this are possible anywhere. In the past these types of watershed-level soil erosion models couldn’t practically be used without accurate elevation data. In addition to soil erosion models, the lidar can be helpful in other applications. These include supporting engineers designing highways and bridges or water resource professionals seeking to run models for hydrology and hydraulics analysis. Whatever the project type, having a deeper understanding of the local topography and other corresponding data layers will paint a clearer picture of the environment and its susceptibility to erosion. 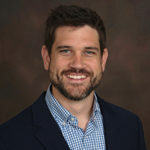 Zachary Nienow, GISP, is a geospatial project manager with extensive experience in digital mapping, GIS, and project management. Zach designs and leads lidar and orthoimagery projects from planning through flight and then data processing, quality control, and completion. He serves a diverse range of clients in the private and public sectors, including many counties, municipalities, and utilities.